Grettir the Strong was a brave and courageous fighter, but he was dogged by ill-fortune his entire life. He was outlawed at the age of 25, and he lived nearly 20 more years on the run in the harsh Icelandic landscape. Grettir made his last stand on the island of Drangey, in Skagafjord in the north of Iceland. His nemesis, Thorbjorn Hook, used evil magic against Grettir in his quest to kill the outlaw. Grettir, half-dead and unable to stand, was aided by his young brother Illugi as the two men faced Thorbjorn and 19 other armed men. 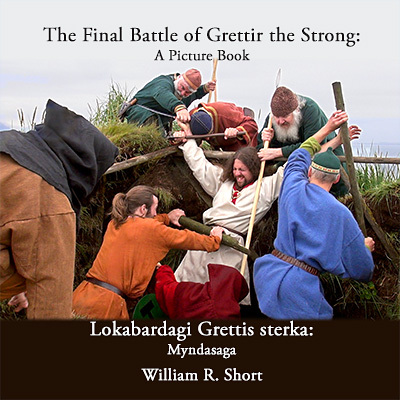 This book brings that battle to life in brilliant color photographs, shot on the location of the actual battle and using realistic weapons, fight moves, clothing, and houses, even going to the extreme of using 1000 year old Viking jewelry and weapons for some of the players. 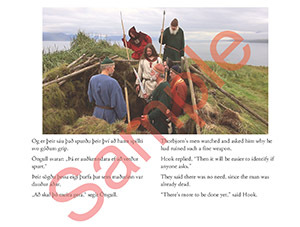 The saga text is presented side by side in the original Icelandic and in English translation. Also please look at our film, The Final Battle of Grettir the Strong. Look at a few sample pages from the book. Return to shop for more Hurstwic merchandise.